September is Strongarm & Lightfoot Month! Happy September, everyone – or as I’m calling it, Strongarm & Lightfoot Month! Today I begin the process of making my final edits on The Adventures of Strongarm & Lightfoot – Assassins Brawl, and the goal is to have a final draft fully edited and formatted by the end of the weekend (preferably sooner, since I have a couple of other books that still need to be written). Part of the Assassins Brawl cover, in progress. The little critter in the handbag may or may not appear in the final version. We’ll see. Copyright Patricia Lupien. 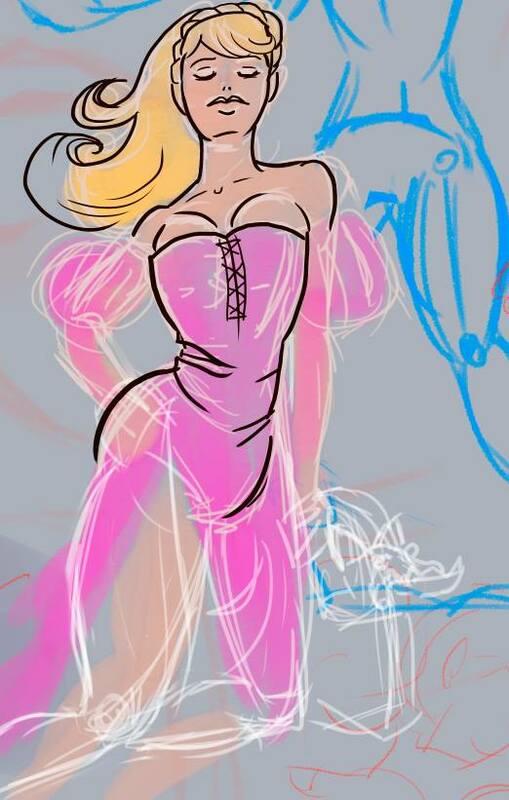 Meanwhile, my cover artist Tricia Lupien will be hard at work on the cover of Assassins Brawl, which riffs on the classic fantasy novel trope of the lusty princess at the feet of the mighty sword-wielding hero — which, in this case, is going to be Erika Racewind. Tricia is drawing inspiration from the original Star Wars poster, with elements from classic John Carter – Warlord of Mars covers (both novel and comic), the Army of Darkness movie poster, and Legally Blonde, although that last one is more a joke that I cracked when Tricia sent me the WIP shot on the right. If all goes well, the whole process will be wrapped up this weekend and the Kindle edition of Assassins Brawl will go up for pre-sale, and the final release date will be Tuesday, September 27. Why September 27? To give people time to grab their free Kindle edition of book one, Scratching a Lich! 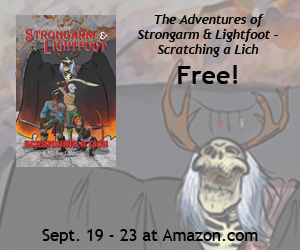 The Adventures of Strongarm & Lightfoot: Scratching a Lich will be available for free through Amazon from Monday, September 19 through Friday, September 23, so if you’re a fan of my Action Figures series but haven’t picked up Strongarm & Lightfoot yet, or you’re a brand-new reader, now’s your chance to check it out and get ready for Assassins Brawl. To wrap up the first post of Strongarm & Lightfoot Month, here is the official synopsis/promotional blurb/back cover text from Assassins Brawl. Enjoy! Derek and Felix learn there’s much more to this plot, and the heroes soon find themselves entangled in a vast conspiracy that threatens to topple a kingdom and take them down in the process.